Flame Busters Slot by Thunderkick - Play at Slotorama! 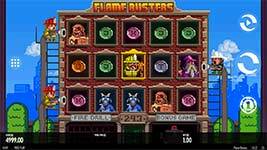 Travel back to 1986 where a few spins on the new and retro-styled Flame Busters slot can win you big pixelated prizes! The game features a burning building where the hero Roasty McFry and other firefighters help you rescue winning spins. Set against a brick building, the game offers 5-reels and 243 ways to win with some fantastic bonus features. The first thing you’ll notice about this game is the retro-styled graphics. You might love it or hate it on first glance, but once you start playing it you’ll definitely be in love. Firefighting hero Roasty McFry is joined by two of his comrades in dousing fires and helping you create new wins. While the game may give off an 80’s arcade vibe because of its graphics and audio, the game is anything but old once you get into the game play. With 243 ways to win and a huge assortment of innovative features, you’re in for fiery time on the reels! 243 Ways to Win – Flame Busters is a 243 pay ways video slot. Land three or more symbols of the same type, positioned left to right starting on reel 1 and it will form a winning combination. Fire Mystery Symbols – The fire symbol is a mystery symbol. When you land one of these it can change into any other symbol to complete wins, except for the wild and scatter. Wilds – The Wild symbol substitutes for any other symbol in the game except the scatter. Alarm Bell Scatter and Free Spins – Land 3, 4 or 5 Alarm Bell symbols anywhere on the reels to win 10, 15 or 20 free spins respectively. Bonus Game – In the bonus game consisting of Free Spins, you collect scatter symbols in order to advance upwards in the bonus game building. For every three scatter symbols collected, a new floor is unlocked and you are awarded with 2 extra free spins! Coin Ignition – For every floor unlocked, the lowest valued coin will turn into the Fire symbol for the remainder of the bonus game. Fire Drill Bonus – This feature can be triggered from the base game and transforms anywhere between 1 and 5 of the low win symbols into Fire symbols.